Many Catholics are acquainted with the heresy known as modernism, which Pope St. Pius X called the "synthesis of all heresies." Briefly, modernism is the shifting of Catholic doctrine from an absolute to a relative basis, founded on alleged human needs and insights, with the result that even if all the traditional words are used, they no longer mean the same things. It is easy to see how this is the entire overthrow of Catholicism. Unlike the other and older heresies, which attacked one or a few dogmas, modernism attacks all of them, while piously claiming to be merely bringing the Faith up to date. As a result, modernism is one of the most dangerous of intellectual movements, and its revival since the 1960s has been the cause of considerable harm to the Church. But there exists another type of modernism, a type that orthodox Catholics, especially perhaps in the United States, have not been equally on their guard against. This is what has been authoritatively termed "social Modernism." In his first encyclical, Ubi Arcano of December 1922, Pope Pius XI (1922-1939) introduced the notion of "social Modernism." The Pope spoke of those Catholics who give lip service to doctrine concerning the social order, including "Catholic teaching concerning...the rights and duties of laborers...in industry" but who "by their spoken and written word, and the whole tenor of their lives" disregard and belittle this teaching.1 Pope Pius goes on to say, "In all this we recognize a kind of moral, judicial, and social Modernism, and We condemn it as strongly as We do dogmatic Modernism. "2 If social modernism is as worthy of condemnation as is dogmatic modernism, then it surely is worthwhile learning what it is and seeking to avoid it. And if we are to avoid social modernism, we must give Catholic social teaching the prominent place in our thoughts and acts that it deserves. It is not my intention in this article to restate the Church's social doctrine. Rather, I hope to show why that doctrine is important and why it is an integral part of the entire corpus of Catholic doctrine. It is not something extra, something merely added on, and which may be disregarded or ignored if one is not interested in it. Still less is it something that may be altered at the desire of individual Catholics, in order to make it suit factors such as the temper of their times or the political and economic traditions of their country. It is no more correct to do this with Catholic social teaching than it is with Catholic dogmatic teaching. In the first place, then, we must ask, what sort of thing is the Church's social doctrine and why is it appropriate that the Church have such? The first question is easily answered. Beginning in 1891 with the encyclical Rerum Novarum of Leo XIII, Leo and most of his successors have issued encyclicals and other documents dealing with what has sometimes been called the social question. That is, these documents deal, inter alia, with the respective rights and duties of workers and owners, with the role of the government in the economy, with a right use of material goods, and in fact with the entire economic organization of society so that all its functions and aspects give glory to God and aid man in attaining eternal life. Pope John Paul II identifies this social doctrine of the Church as part of moral theology.3 And it is in that light that we should proceed. For long before 1891, in fact throughout the history of the Church, the Magisterium, together with orthodox theologians, have had to instruct the faithful on questions of moral theology. Now since one of the commandments of God is, "Thou shalt not steal," and since justice is one of the four cardinal moral virtues, questions concerning justice are obviously a major part of moral theology. In the great age of the Scholastics, theologians often treated of questions of justice, examining in great detail where justice comes into human affairs, and particularly into the economic transactions of the time. A few centuries later, in 1745, Pope Benedict XIV felt compelled to address an encyclical letter, Vix Pervenit, to the bishops of Italy, on a question of economic justice, restating the Church's teaching on the immorality of usury, a teaching that, of course, remains true today. Now in doing all these things, the Supreme Pontiffs, and those theologians who sought faithfully to interpret Catholic doctrine, were moved by their concern for both our temporal and our eternal existence. That is, like our Lord, who healed both souls and bodies and fed the hungry, the Church has never approached questions of economic justice or injustice with the spirit of a social worker or politician or economist. The charge that Jesus gave the apostles, "Go therefore and make disciples of all nations...teaching them to observe all that I have commanded you..." (Matthew 28:19-20) obviously necessitates teaching the whole law of God, and this includes the right use of our earthly goods. For the manner in which we make use of these earthly goods has much to do with whether or not we will obtain our spiritual reward in Heaven. The social teaching of the Catholic Church, then, deals extensively with questions concerning "social and economic problems." For example, it upholds the right in strict justice of a worker to receive a just and living wage, it supports the natural right of the worker to unionize, it calls for more cooperation between owners and workers, it defines the role of the government in the economy, condemning both those who want a state-run economy and those who wish to eliminate the role of government from economic affairs - it deals with all these questions, but it does so for spiritual ends and in a manner that is essentially spiritual. On the natural level, all the members of the human race are brothers, because we have one Father who created us and we take our origin from the same first parents. This is the foundation for a corporate or social view of humanity. But for the baptized this unity is even greater, since we have all been made adopted sons of God (Galatians 3:5-6). Additionally, in his first letter to the Corinthians, St. Paul teaches that the Catholic Church is the Mystical Body of Christ and the members of the Church are jointly members of this Mystical Body (I Cor. 12:12-30). Thus we are brothers, both naturally and supernaturally, but how are we to live together as brothers? 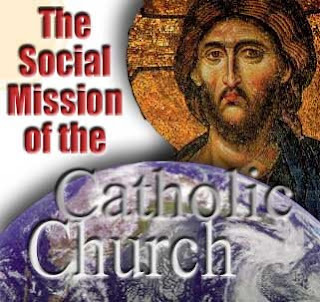 The Church holds out a vision to us, of what John Paul II calls "a civilization of love," a social order animated by justice and charity, or by what is sometimes called the virtue of solidarity.6 Thus the social teachings of the Church must be thought of not as academic commentaries on economics, which somehow the various popes, almost by accident began creating, but rather a foreshadowing of "the holy city Jerusalem coming down out of heaven from God" (Rev. 21:10). It is like the situation described in Psalm 133, "Behold, how good and pleasant it is when brothers dwell in unity!" If the Church is calling us to create such a civilization of love, it is necessary to view the moral theology of the seventh commandment as more than a command concerning personal morality. Of course it is that, for all morality arises from personal responsibility and all sin arises from personal sin.7 But if we can grasp the notion of not merely separate individuals, but of all of society dedicated to the service and glory of God, of the economic transactions of our corporations or the trading relations of two nations subject to the same moral law as the dealings between two individuals, then we will have begun to understand what the Church proposes to us in her social teachings. For all of the social teaching of the Church presupposes not merely a reformation of individuals but a reformation of society.8 And this brings us to another important concept: Christ the King, not only of individuals, but of societies and entire nations, in fact, of all mankind. Pius XI, who did so much to put modern Catholic social teaching on a sure foundation in his Quadragesimo Anno, wrote another encyclical which is not usually classed among the social encyclicals. This is the encyclical Quas Primas, on the Kingship of Christ, issued on December 11, 1925. To try to understand Catholic social teaching apart from the Kingship of Jesus Christ is to have only a partial and one-sided view of the matter. For "all men, whether collectively or individually, are under the dominion of Christ." Moreover, "It would be a grave error...to say that Christ has no authority whatever in civil affairs, since by virtue of the absolute empire over all creatures commited to Him by the Father, all things are in His power. "9 If we develop these points we can see that, looked at as part of the kingdom of Jesus Christ, nothing that mankind does, either individually or corporately, can be alien to Christ's law and his kingly rule. Therefore the Church, as the mystical extension of the Incarnation, is not doing anything foreign to her mission when she provides guidance for bringing about the realization of Christ's Kingdom in the affairs of men. We are all Christ's subjects, and as such we are bound to make our institutions and our customs reflect him. Catholics should not dare to have a conception of business or economic life that is based either on practical atheism or on a deism that sees God as simply a distant Creator, who left a kind of clockwork universe that runs by itself, as in Adam Smith's "invisible hand." Just as we would not allow the sexual appetite to rule itself, on the grounds that since it was created by God somehow it would ultimately work everything out for the good, so we cannot allow the appetite for economic gain to have free rein. For as Pius XI taught, "Just as the unity of human society cannot be built upon 'class' conflict, so the proper ordering of economic affairs cannot be left to the free play of rugged competition. "10 For to do so would be to think and act as if, whenever men gathered into societies or groups, including nations, somehow they could forget the kingly law of Jesus Christ. If it is wrong to hurt the person living in the next house, it is likewise wrong to hurt my employee or even my competitor, for are we not brothers and are we not all subjects of our common King? And if we cannot see how it is possible not to hurt them in order for myself to survive in the business world, then we need to rethink our approach to economic life and change the demands that our economic system makes upon each of us. For more basic and more demanding than any of its strictures are the moral law and the fundamental principles of justice and charity. The laws of physics describe how particles of matter move and react under certain conditions. Because these particles do not have free will, they have no choice about their behavior and they cannot be blamed for what they do. The so-called laws of economics, however, are about the actions of free human persons.11 Because of this freedom they can yield or refuse to yield to their various concupiscible appetites. The laws of economics are descriptions of what human beings will generally do if they yield themselves fully to their concupiscible appetite for gain. But whenever this appetite for gain runs counter to the law of Christ, it is entitled to no more respect than when the sexual appetite similarly runs out of bounds. And just as with the sexual appetite, we must curb our appetite for gain if our activity is likely to bring harm or disruption to a social order that supports a civilization of love. In addition to these considerations on our attitude toward hurting or helping our fellow subjects of Christ the King by our economic activity or our choices as consumers, there is one additional thing which has been insisted upon by the Church's Magisterium that is important to her social doctrine. This is nicely expressed by St. Paul in his first letter to Timothy, chapter 6, verse 8. He writes, "...if we have food and clothing, with these we shall be content," and just after that, in verse 10, "For the love of money is the root of all evils...." These verses may serve to introduce the notion of a certain necessary restraint in our possession and use of material goods. The entire aim of the Christian revelation and of the divine economy is to save mankind from eternal death. Our life here on earth is not our final fulfillment. While certainly they are not evil, material things in this world are merely our temporary possessions, and, as the New Testament points out in many places, they can easily come between us and God. But since for some time our society has piled up more riches every decade, and people usually acquire a higher standard of living as they grow older, we must stop and ask ourselves the question whether all this is a good or not. Has it helped to remove the attention of our minds from the inevitable fact of our coming death and judgment? Can riches cloud our intellects and weaken our wills, so that we do not strive for heavenly things with the ardor that we ought to? Were our ancestors, poorer than we, perhaps more pious than we? Yet we are accustomed to justify our economic system with the argument that it produces great wealth and has made us rich in comparison with those who lived before us. Perhaps the best reply to that is the words of St. James, "Come now, you rich, weep and howl for the miseries that are coming upon you" (James 5:1). If we really believe that the Faith is true, we must be prepared to scrutinize all that we do and all that our society does in the light of the Gospel and of the one thing necessary, the attaining of eternal salvation. If the Kingship of Christ Jesus over all men and over every aspect of human affairs is a fact, not merely a fancy which we use to decorate our piety at appropriate times, then this fact requires our utmost attention, and all the other activities and institutions of human existence must be shaped to recognize that Kingship. Thus we see that far from being something extra added onto Catholic dogma, the social teachings are integral parts of the realization of the Lordship of Jesus Christ the King. Every year we celebrate the feast of the Kingship of Christ and thus every year we have a new opportunity publicly to reaffirm these truths. But every single day we have the opportunity not just to reaffirm them, but to try to see how they can be put into practice. Otherwise, how can we avoid the condemnation of that Supreme Pontiff, who said of social modernism, "We condemn it as strongly as We do dogmatic Modernism?" 1. Encyclical Ubi Arcano, no. 55. 3. Encyclical Sollicitudo Rei Socialis, no. 41. 4. Encyclical Rerum Novarum, no. 1. 5. Encyclical Quadragesimo Anno, no. 41. 6. Cf. Encyclical Centesimus Annus, no. 10. 7. Cf. Encyclical Sollicitudo Rei Socialis, no. 36. 8. To mention only a few examples, see Rerum Novarum, nos. 22, 25; Quadragesimo Anno, nos. 76-80, 88, 110, 132-133 and 136; Centesimus Annus, nos. 48-51. 9. Encyclical Quas Primas, no. 8. 10. Encyclical Quadragesimo Anno, no. 88. 11. Cf. Encyclical Quadragesimo Anno, no. 42.